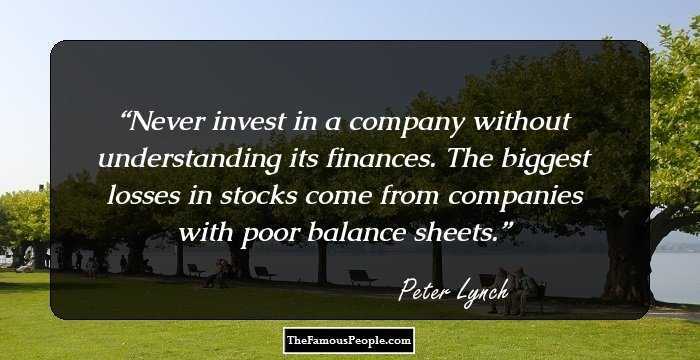 A collection of quotes and thoughts by Peter Lynch on financial, advice, planning, investment, inspirational, philosophy, business, future, money and game. Peter Lynch is a distinguished American mutual fund manager, investor and philanthropist. His performance record has earned him the status of a ‘legend’ by financial media. He joined as an intern at the ‘Fidelity Investment’ wherein he initially published papers. He has been a co-authored and authored a number of papers and books on investing. ‘Invest in what you know’ and ‘ten bagger’ are few of the well-known financial planning mantras which have been coined by him. It is said that Lynch got most of his ideas while walking through the grocery shop along with his friends. 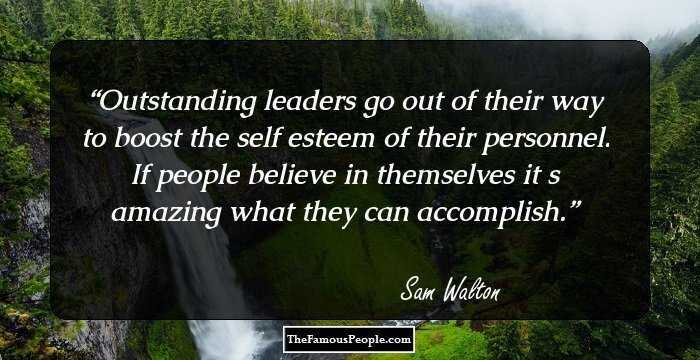 Few of his notable books include, ‘Lear to Earn’, ‘Beating the street’ and ‘One Up on Wall Street’ amongst others. He also used to write a column for the magazine, ‘Worth’. 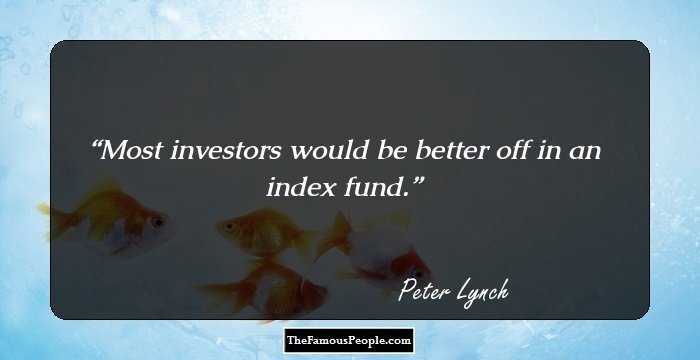 Peter’s words, thoughts, strategies and views on money making, investing and stock market would leave you thinking. 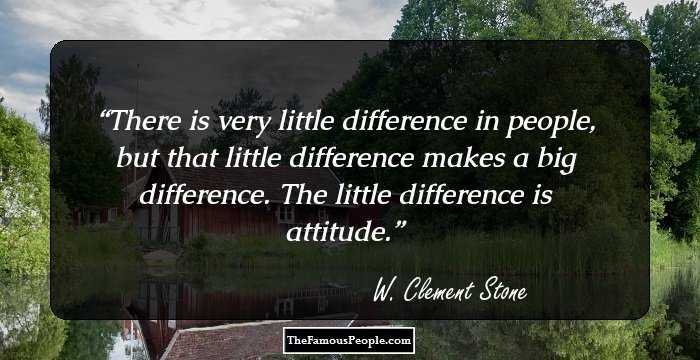 We have accumulated few of his words below from his work and life. 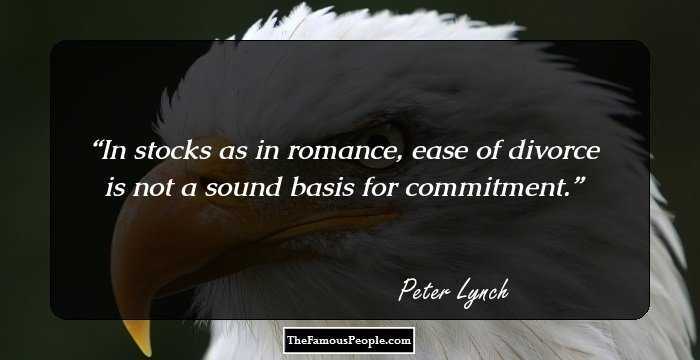 Following is a collection of pearls of wisdom in form of quotes and sayings by one of the greatest investing minds, Peter Lynch. 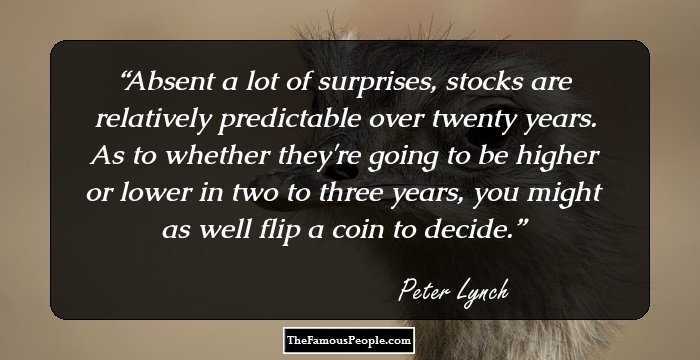 Absent a lot of surprises, stocks are relatively predictable over twenty years. As to whether they're going to be higher or lower in two to three years, you might as well flip a coin to decide. 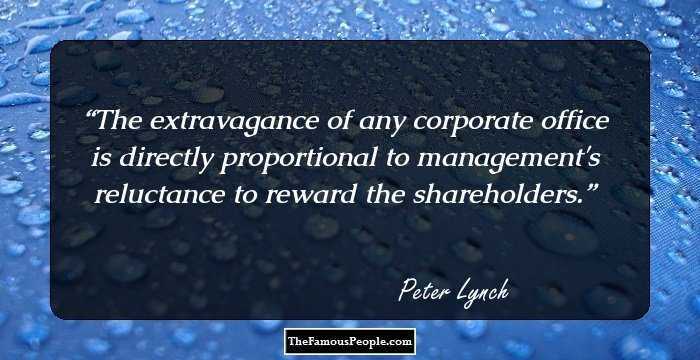 The extravagance of any corporate office is directly proportional to management's reluctance to reward the shareholders. 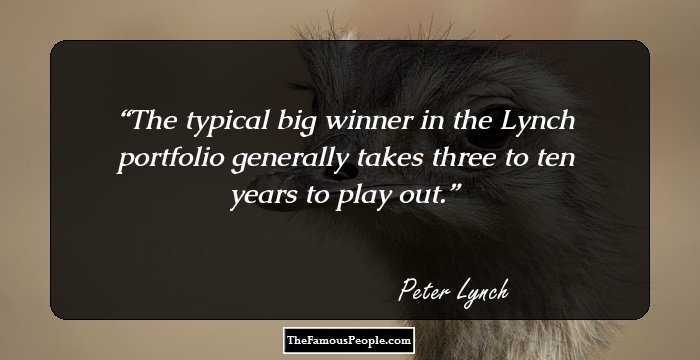 The typical big winner in the Lynch portfolio generally takes three to ten years to play out. The biggest winners are surprises to me, and takeovers are even more surprising. It takes years, not months, to produce big results. All the time and effort people devote to picking the right fund, the hot hand, the great manager have, in most cases, led to no advantage. I'm always fully invested. It's a great feeling to be caught with your pants up. 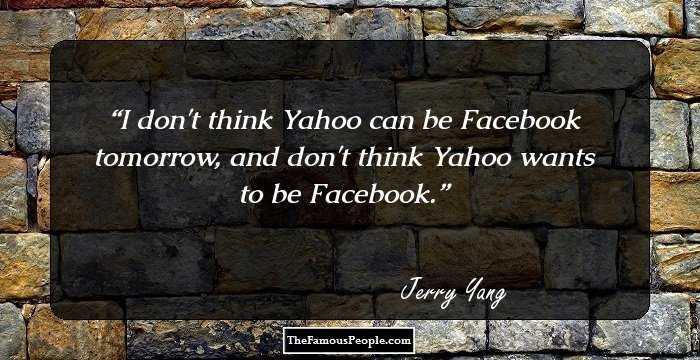 You have to keep your priorities straight if you plan to do well in stocks. A stock market decline is as routine as a January blizzard in Colorado. If you're prepared, it can't hurt you. A decline is a great opportunity to pick up the bargains left behind by investors who are fleeing the storm in panic. A price drop in a good stock is only a tragedy if you sell at that price and never buy more. To me, a price drop is an opportunity to load up on bargains from among your worst performers and your laggards that show promise. If you can't convince yourself 'When I'm down 25 percent, I'm a buyer' and banish forever the fatal thought 'When I'm down 25 percent, I'm a seller,' then you'll never make a decent profit in stocks. If you can follow only one bit of data, follow the earnings - assuming the company in question has earnings. I subscribe to the crusty notion that sooner or later earnings make or break an investment in equities. What the stock price does today, tomorrow, or next week is only a distraction. The old Wall Street adage "never invest in anything that eats or needs repairs" may apply to racehorses, but it's malarkey when it comes to houses. The trick is not to learn to trust your gut feelings, but rather to discipline yourself to ignore them. Stand by your stocks as long as the fundamental story of the company hasn’t changed. People who succeed in the stock market also accept periodic losses, setbacks, and unexpected occurrences. Calamitous drops do not scare them out of the game. 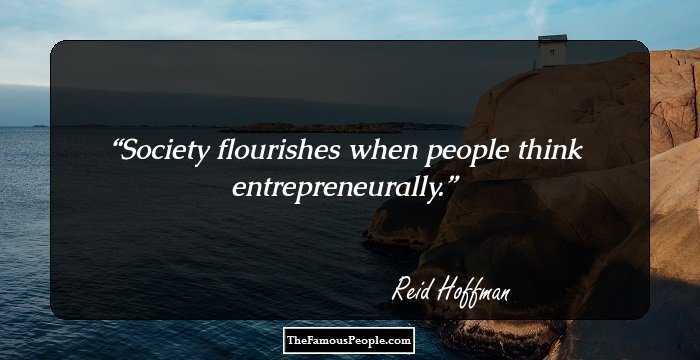 Go for a business that any idiot can run – because sooner or later any idiot probably is going to be running it. If you're lucky enough to have been rewarded in life to the degree that I have, there comes a point at which you have to decide whether to become a slave to your net worth by devoting the rest of your life to increasing it or to let what you've accumulated begin to serve you. Whenever you invest in any company, you’re looking for its market cap to rise. This can’t happen unless buyers are paying higher prices for the shares, making your investment more valuable. Logic is the subject that has helped me most in picking stocks, if only because it taught me to identify the peculiar illogic of Wall Street. Actually Wall Street thinks just as the Greeks did. The early Greeks used to sit around for days and debate how many teeth a horse has. They thought they could figure it out just by sitting there, instead of checking the horse. 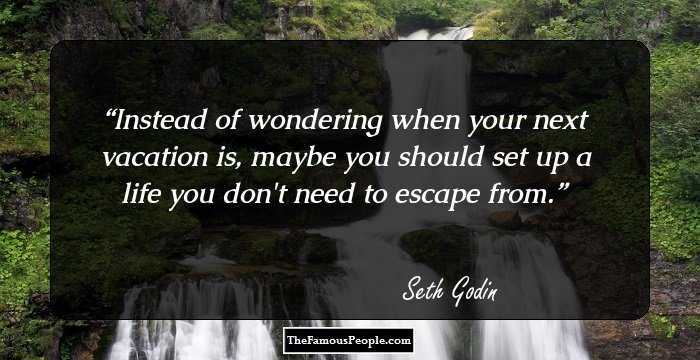 A lot of investors sit around and debate whether a stock is going up, as if the financial muse will give them the answer, instead of checking the company.